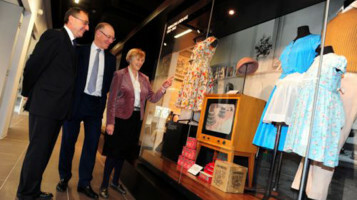 On Friday 16 March we celebrated the opening of the new M&S Company Archive building. The ribbon was cut by M&S Chairman Robert Swannell, together with former Head of MI5, Dame Stella Rimington and Vice-Chancellor of the Univeristy of Leeds Professor Michael Arthur. Robert Swannell said: "We're proud to have opened the doors of this impressive new building which is the result of a successful and prosperous partnership between M&S and the University of Leeds. The hard work and commitment that has gone into making this possible means that the history of M&S as an iconic British retailer is accessible for all to enjoy and will continue to evolve back in the city where it all began on Michael Marks' Penny Bazaar stall for many more years to come." We were delighted to welcome so many visitors to the archive on our first day of business.